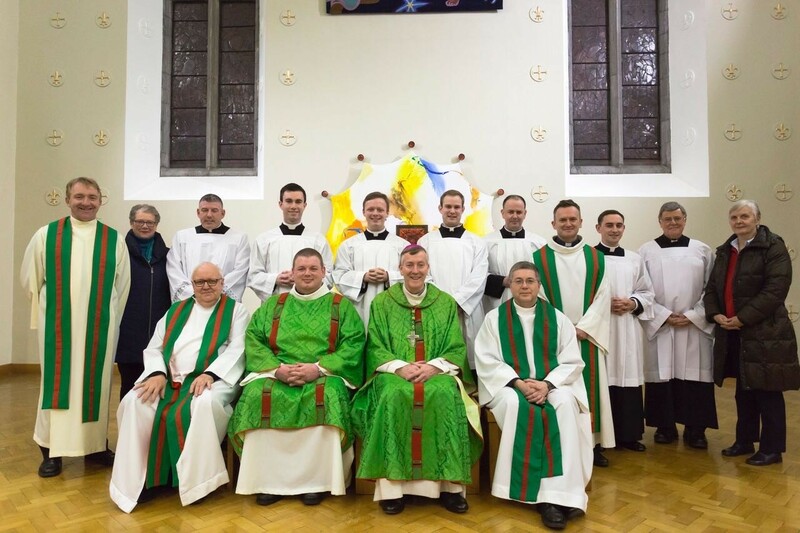 On Thursday 23rd February in St Patricks College, Maynooth Bishop Denis conferred seven seminarians with the Ministry of Acolyte. This conferring allows the seminarians to assist in the liturgy and is another step in their journey to priesthood. 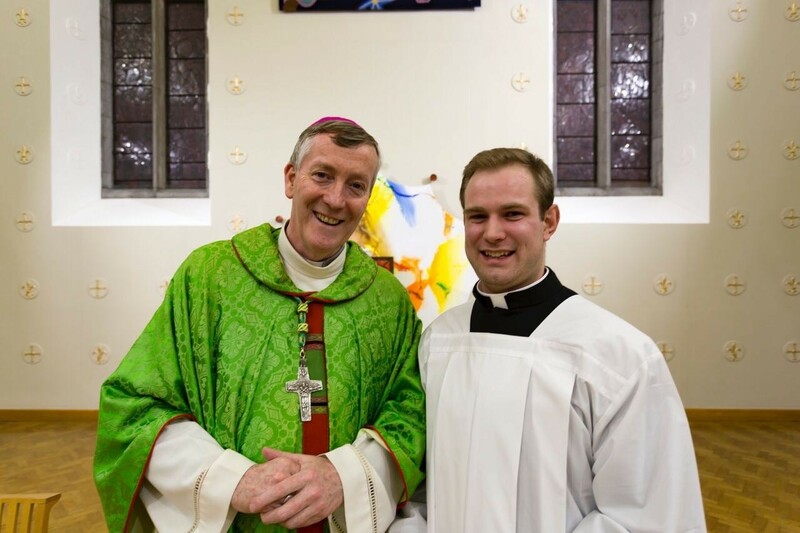 “This is a very special evening in the lives of seven seminarians here in St. Patrick’s College, Maynooth. Christopher, Daniel, Darren, Martin, Ronan, Shane and Thomas – you come from Dioceses that span the entire country – north, south, east and west. While your numbers are smaller than in times past, the commitment and dedication that have brought you to the seminary are probably stronger than ever. Seminary is about discernment, it is about putting flesh and bones on your noble aspirations towards the priesthood. This evening is another significant step on that vocation journey. We gather on this the Feast of St. Polycarp, February 23rd. We probably know more about the grisly accounts of his death in 155AD, than we do of his life, but what we realise is that here is a Saint who directly knew the Twelve Apostles. He would have heard the preaching of John; he was apparently a prolific writer of pastoral letters, one surviving three hundred years after his death, such was the esteem the people held him in. Saints are by their nature held in great esteem, martyrs even more so. Martin Scorsese’s film adaptation of ‘Silence’ gives us a gripping Hollywood insight into a martyr’s death – not dissimilar to our friends commemorated earlier this month, Saints Paul Miki and his Nagasaki companions. While the blueprint of martyrdom isn’t exactly expected of an Acolyte, anyone who chooses to follow Christ, takes up that Cross as an integral part of the following. This evenings liturgy takes its cue from the readings of the day. Ecclesiasticus could easily be describing the secular tensions that confront all today trying to live their baptismal calling. It is the world of your peers, where money matters; where there is more interest in how you look than who you are, where sin is contextualised and often obscured. The lines around what is right and wrong have been blurred – Ecclesiasticus seems to suggest don’t depend on a death bed conversion, it just might be too late. Those who I accompanied in last September’s Opening Year Retreat here in the seminary might remember my love for the very first psalm, and tonight that psalm forms the frame for our ceremony of Acolyte. “Happy the man who has placed his trust in the Lord” and the verb ‘to linger’ in the very first verse is strong: “nor lingers in the way of sinners”, equally relevant is the line “nor sits in the company of scorners”. The gospel acclamation, leading us nicely into Mark’s text could be the mission statement of a seminary or a formation programme: “blessed are those with a noble and generous heart, take the word of God to themselves and yield a harvest through their perseverance”. The seven who are being admitted to the Institution of Acolyte are living those words completely. Mark’s gospel deals head on with scandal and its destructive erosive force in any society and indeed in any seminary. On December 8th last the new Ratio Fundamentalis Institutionis Sacerdotalis was produced by the Congregation for the Clergy. It is appropriately titled ‘The Gift of the Priestly Vocation’. In the very earliest lines it reminds us that seminarians beginning formation are “’uncut diamonds’, to be formed both patiently and carefully, respecting the conscience of the individual, so that they may shine among the People of God”. The Ratio, as it has come to be known speaks as much to formators as those in formation. I love its emphasis on the community nature of the seminary. 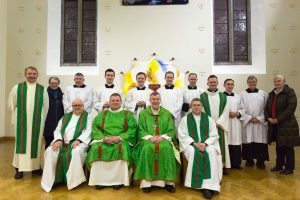 It says “this community leads the seminarian, through ordination, to become part of the ‘family’ of the presbyterate, at the service of a particular community”. In other words, a seminarian needs to be present and that’s not just physically present; a seminarian needs to realise he is part of a community, part of a family that enables him one day to build community and nourish the family we call parish. Acolyte is a refining, there is more work to do; I encourage you and those in charge of your formation to continue to allow yourself to be honed and polished as you continue your discernment towards priesthood. Returning to the Ratio; a seminary is a “community, indeed a family, marked by an atmosphere that favours friendship and fraternity”. Later tonight I am delighted that twenty priests of Kildare & Leighlin will come here to celebrate Evening Prayer with our four seminarians. It is a visit of support, it is a visit of encouragement and it is a visit of affirmation. This evening together with the seminary I offer my support, my encouragement and my affirmation to the seven men Christopher, Daniel, Darren, Martin, Ronan, Shane and Thomas soon to be instituted as acolytes. I pray your role as an assistant in the liturgy will deepen your faith and understanding of the sacrifices many people like St’s Polycarp, Paul Miki & Companions and many others made to follow Christ and reflect his life in theirs. May you do just that. Amen”.